Word "energy" affects all of us. The climate in our earth is affected by all of us by the consumed energy used for ourselves. That is us, who can influence the consumption of energy and that is us, who make decisions how much energy we spend. Fossil energy sources (coal, gas, oil..., thus non-renewable resources) are limited and therefore their price is constantly increasing. There is expected, that they will continue to rise up. Energy which is environmentally friendly and also we do not pay for it, is renewable energy that gives us for example sun, wind, water ... Low energy houses, passive houses and active homes are houses, which are trying to utilize utmost the solar energy. According to statistics, in our households is wasted above 60% of all energy for heating. In member states of European Union the buildings consume 40% of the total energy, therefore, the interest in the energy-optimized solution of houses is raising constantly. In case, you are not missing funds and you want to reduce power consumption compared to the prescribed standards - you can choose variant with higher quality of thermal insulation properties and with higher-quality of home technology equipment. It is always individual, as we reach the optimal solution. It depends on the number of inputs according to the investor. To make the right decisions plays a role not only price, which we will pay for heating, but also the input building costs for the house. Houses in the basic Euroline´s standard meet all the criteria, resulting from thermo-technic standards and current legislation. Estimated energy consumption is reported in each house. It is the value, what means how many kWh of energy is spent in the house for a one year per squared meter. Total consumption of house we have to multiply by total floor area. Euroline Slovakia offers 67 low energy family houses of the basic standard. In our condition the optimal solution seems to be a low-energy house. The house is considered as a low-energy, if the consumption of energy for heating does not exceed 50 kWh/m2. 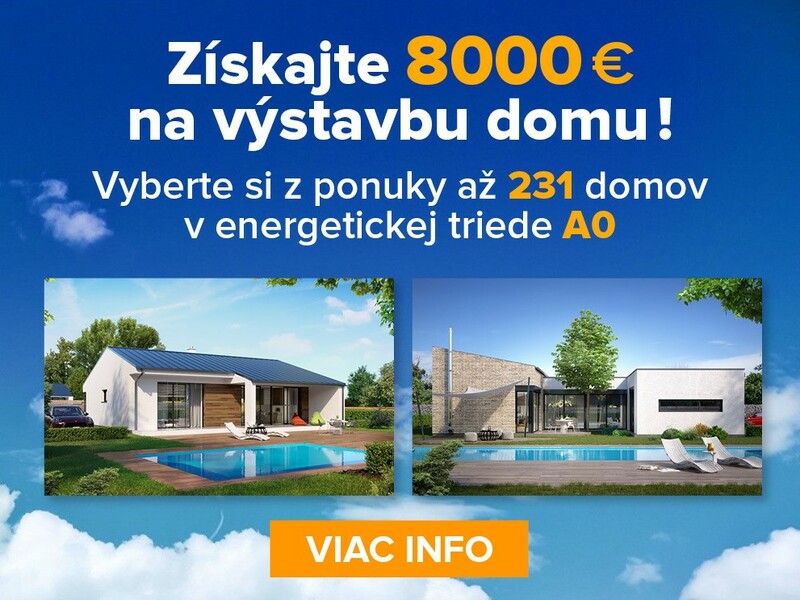 In view of the fact that, we don´t know in which area you want to build your house, therefore it is not possible to determine beforehand, how much energy you actually spend - we offer you house of low energy standard. Heat pump (air - water), alternative gas condensing boiler with solar heating support of hot drinking water. Modification of the house will require increased financial demands about 10 - 20% compared to the price of the house of standard design. Heating costs Your heating costs can decrease about 40 - 60%. For example Praktik 97 of the low-energy version will be about 12% more expensive than basic version of the standard execution.